ES native plants are survivors! They held an important place in the shore’s local ecology prior to John Smith’s landing and are well adapted to the Shore’s soils and climate. ES natives generally require less watering and fertilizing than non-natives, and are less susceptible to drought. ES natives are often more resistant to insects and disease and less likely to need pesticides. ES natives can be resistant to occasional salt- water stress. ES natives help preserve the diversity, beauty, and function of our natural ecosystems. The Shore is one of only a few rest stops for songbirds traveling thousands of miles each spring and fall. That’s quite a long trip for birds that can weigh as little as half an ounce! 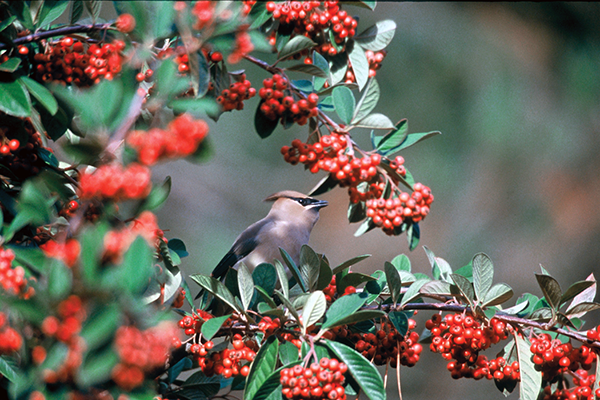 Native trees and shrubs provide shelter and the berries and insects that songbirds eat to fuel their long journeys. Even the smallest lot can provide critical migratory “stopover habitat” for a few migrants. Research by the Center of Conservation Biology at William and Mary has shown that a 50% increase in the density of under story vegetation results in a 50% increase in the number of migrant birds supported. Help make the Shore a generous and safe rest stop. Adult butterflies are attracted to the showy flowers and nutritious nectar of native wildflowers. Many must lay their eggs on specific species of native plants which provide essential food for their caterpillars. The Monarch butterfly, which also migrates through the Shore, needs to lay its eggs on milkweed. There are two milkweeds native the Shore - Swamp Milkweed and Common Milkweed. Using native plants in your garden or landscape will not only help ensure the survival of our butterflies, but will attract an abundance of these colorful visitors to your garden. Landscaped areas of native trees, shrubs and groundcover can result in 50% less runoff than grass lawns, significantly reducing non-point source pollution. This protects water quality in the Shore’s creeks and inlets, as well as the Shore’s shellfish and underwater grasses. The Shore is the largest source of aquaculture grown hard clams on the East Coast. In 2004, according to a Virginia Sea Grant Study, the total economic impact of hard clam aquaculture was almost 50 million dollars!